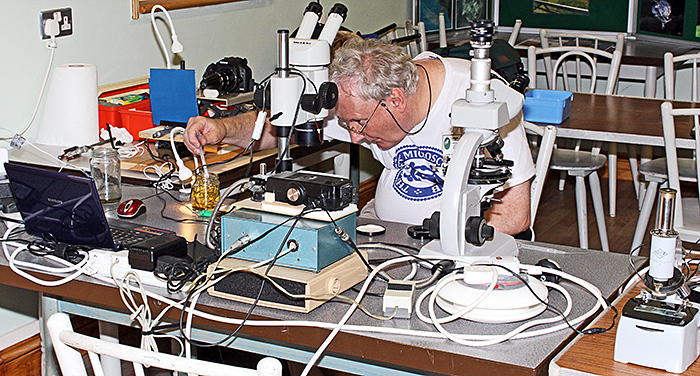 The day after the Quekett excursion, on another sunny day, Graham Matthews and Alan Wood returned to the Visitor Centre at Warnham Local Nature Reserve in Sussex to put on a display of microscopy for families attending the Reserve’s I-Spy Nature Day, as part of the Club’s outreach programme. 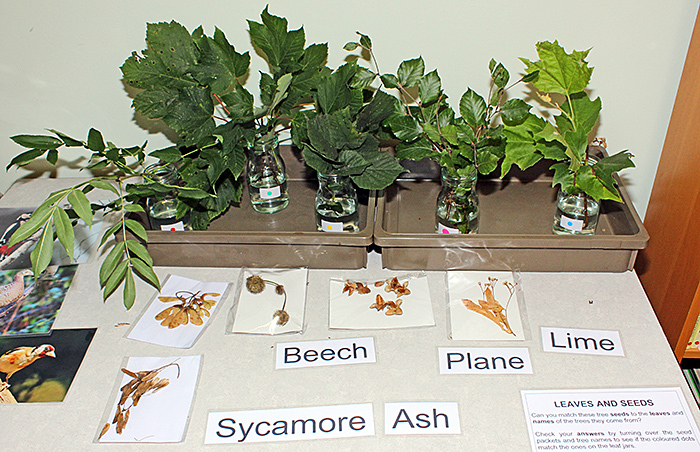 We had a good number of visitors, although some of the children were too young to use our microscopes. Graham brought his Wild M8 stereomicroscope, Zeiss stand fitted with a Leitz DIC condenser and objectives, an old Baker school microscope (modified to use LED illumination), a Veho Discovery, an NHM Microscope, and his home-made stacking apparatus. 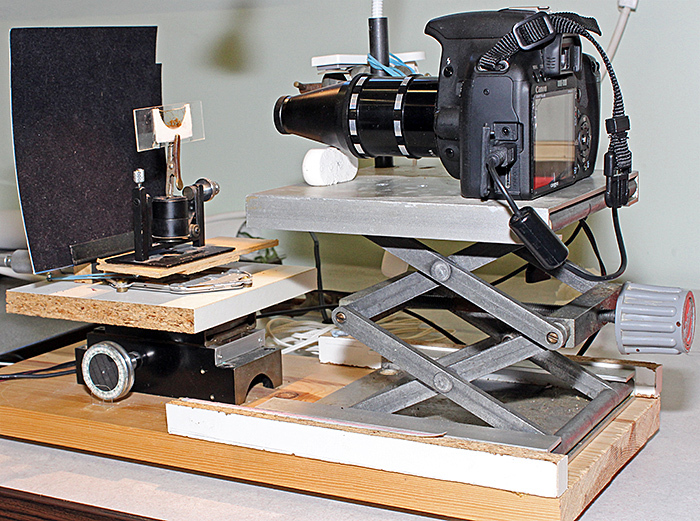 The camera part of the stacking apparatus is a Canon EOS 500D digital SLR camera with a couple of extension tubes and a conical adapter for a Watson 75mm objective, all supported on a laboratory jack so that it can be raised and lowered. The subject support includes an old Flatters & Garnett specimen holder mounted on part of a CD drive with a micrometer to permit very fine adjustments, all mounted on a coarse focus for approximate adjustments. 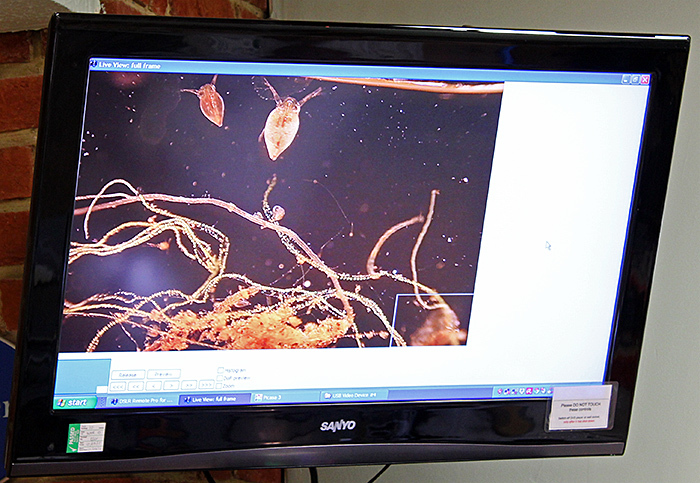 Graham used his Baker school microscope to show a single example of S. vetulus on a slide, and sometimes replaced the eyepiece with a webcam so that the waterflea could be seen on the television. 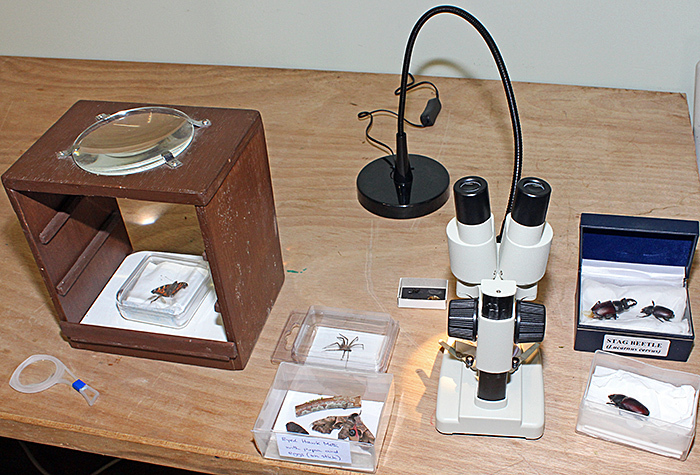 Alan Wood took 3 microscopes suitable for children (a new Chinese stereo with fixed 20× magnification and built-in LED illumination for under £40 from eBay seller gt-vision, and two of the new version of the NHM Microscope) and his Olympus SZ4045 stereomicroscope (with Ikea Jansjö LED lamp). 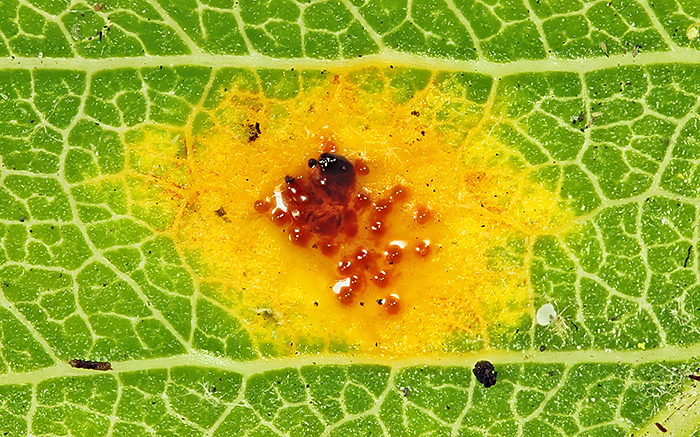 Alan’s live specimens included waterfleas and filamenous algae from one of the Reserve’s ponds, yellow (Xanthoria sp.) 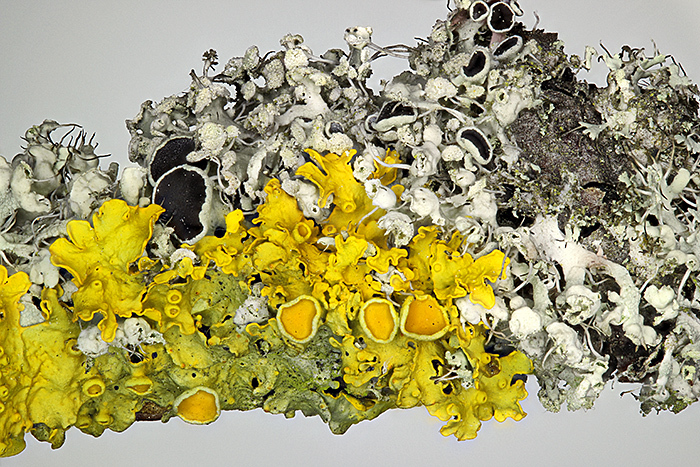 and grey foliose lichen on a pear twig, pear leaves with a fungal gall, and fern sori. 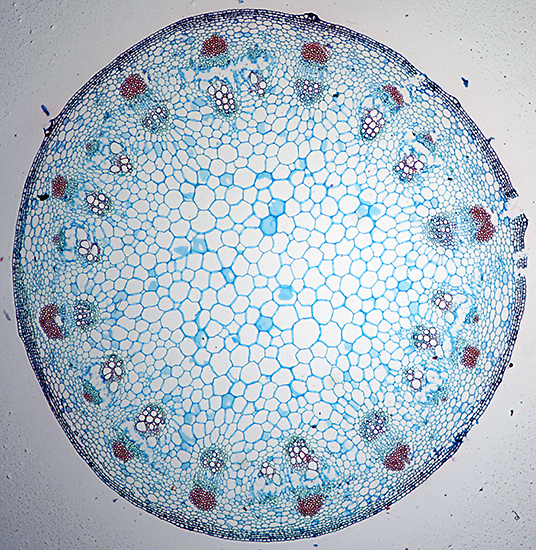 He also brought some prepared slides to view with the NHM microscope, including a mosquito larva and a stained cross-section of the stem of sunflower (Helianthus sp.). 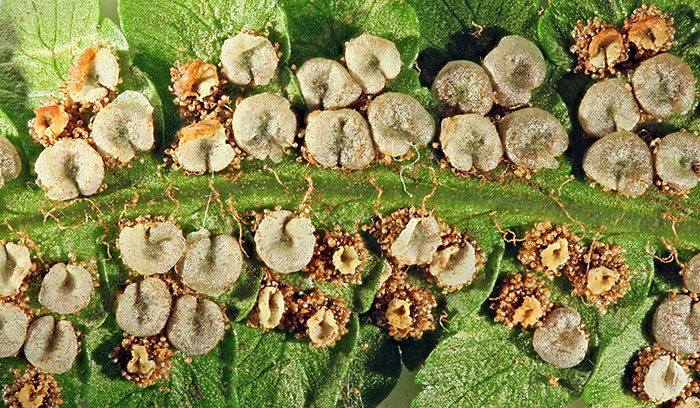 In the same room with us there were displays of spore bodies of ferns, leaf skeletons, insects and a spider with magnifiers and a familiar-looking stereomicroscope and LED lamp for observing them, some feathers, and a quiz involving matching up the names, leaves and seeds of 5 trees found on the Reserve. 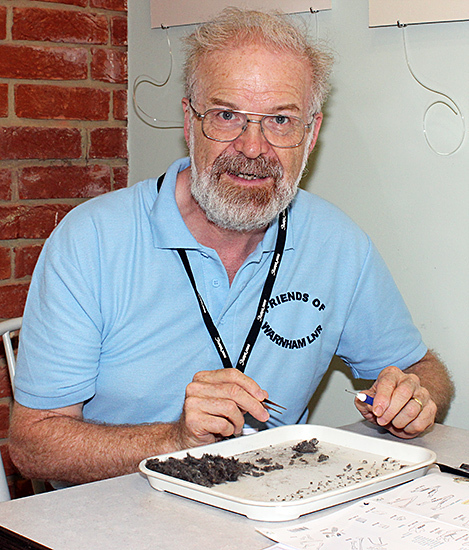 Richard Symonds also shared the room with us, demonstrating how to dissect owl pellets to remove the bones of small mammals, and how to identify the bones. Richard used a variety of tools, including a kit for carving wax, and an instrument scrounged from his dentist. 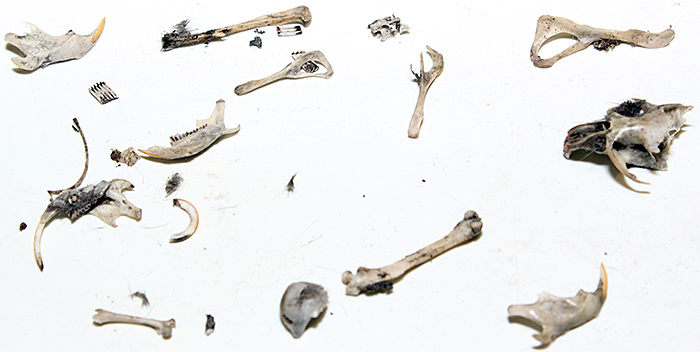 He found mandibles (lower jaws) of bank voles (Myodes glareolus (Schreber)) and water voles (Arvicola amphibius (L.)), and Graham took a series of 28 photographs of the latter and produced a stacked image.